Delirium by Lauren Oliver is about Lena Haloway and her life in an alternate USA where love has been declared the deadliest disease ever. All people at the age of 18 must undergo a procedure called the Cure. Until then, people are not allowed contact with the opposite gender, for if they do, they may fall in love. They say, if you get the Cure, you will never feel pain again. Once cured, people are assigned a college, a major, and a mate. They are not allowed to choose whom they want to marry. They are told how many kids to have, and given a job for life. They believe that love truly is a disease, and being cured, everything will be all right. Once cured, their lives are set on a track and all planned out; they don't have to worry about what will happen to them. They are safe. The people all end up happy. The government scientists tried to administer the Cure three times, but it never worked. But before they could try a fourth time, Lena's mother killed herself. Her last words to Lena: "I love you. Remember. They cannot take it." Lena is looking forward to the time when she receives the Cure. She won't feel the pain that she feels when she thinks about her mother; it will disappear. She will be "safe, free from pain." Until she meets Alex, a boy about her age. They start spending time together more and more often. What will happen to them if they fall in love? This would be forbidden. The government controls what everyone does. The people don't get to choose their own path; it is chosen for them. It is laid out in a nice neat line, no curves. And they are happy this way, mostly. But this is not okay, is it? The government is stripping people of a basic right: the power to choose -- to choose how they want their lives to be, to even choose how they feel. It's perfectly fine for the government to want everybody to feel safe and happy, but by stripping away basic rights and freedoms -- that's not right, is it? Even if most of the citizens do feel more relaxed and happy and safe? Lena's friend Hana says that in order to be truly happy, maybe you have to be unhappy sometimes. And Alex is a resister, and an "Invalid," someone who lives out in the Wilds, avoiding the law. But Lena is looking forward to her Cure; will they persuade her to change her mind? This book is kind of like The Hunger Games, with a corrupt government trying to control everything that people do. Both books' heroines are female teenagers of about the same age. There is one big difference, however -- In The Hunger Games, everybody (except the citizens in the Capitol) knows that the Reaping and the Games are terrible, and an injustice. In Delirium, most people agree with the government and are okay with the Cure. Even Lena is excited about getting her Cure soon. At first. 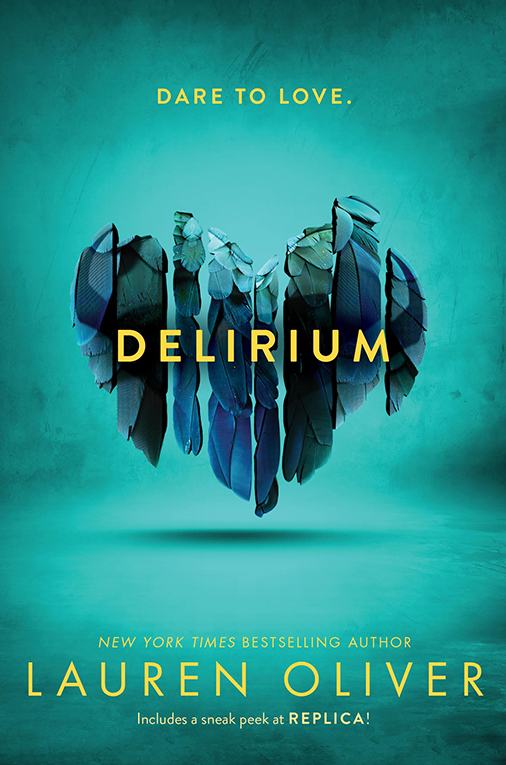 Delirium is about love, but it is also about standing up for what is important to you. This book is long (over 440 pages) and the characters use a lot of swear words; this book is not for younger readers. It is a little more mature than The Hunger Games; there is less violence in this book, but the plot is harder to grasp. Middle school students and up will enjoy this, especially if they liked The Hunger Games. Daddy's afterthoughts: Julia does not know the word "dystopia," so I'll supply it. This book (actually, the first book of a short series) is an excellent entry into the canon of YA dystopian fiction. It bears some resemblances to the aforementioned Hunger Games series, as well as the Divergent trilogy. It bears thematic similarity to Lois Lowry's The Giver, which many students will read in 7th, 8th, or 9th grade, as well as Kurt Vonnegut, Jr.'s short story "Harrison Bergeron," Ayn Rand's Anthem, and the dystopian novel supreme, 1984. (I do NOT recommend 1984 for 11 to 13 year-olds, though The Giver and Anthem are very readable by junior high school readers). Excellent idea for a blog! Glad to have learned something from you, KEEP IT UP! How about doing a review on Madeleine L'Engle's A Wrinkle In Time?